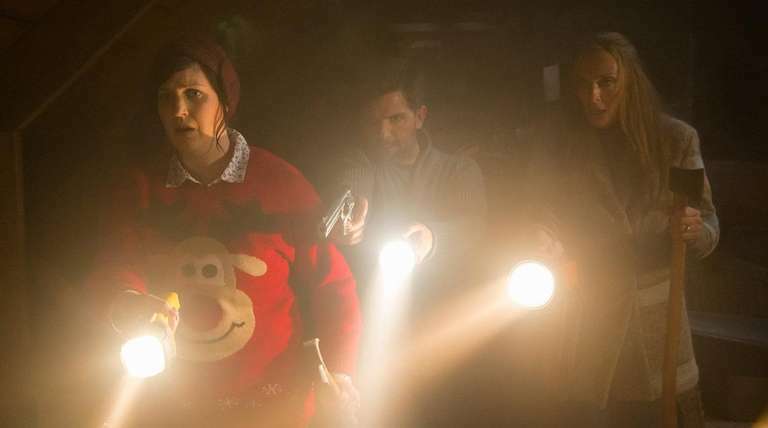 BOTTOM LINE A yuletide horror-comedy that’s stingy with laughs and scares. The extended Engel family gathers for Christmas in a posh suburb but winds up creating a holiday hell in “Krampus,” a horror-comedy from writer-director Michael Dougherty. It’s a pleasantly perverse idea with potential for grisly humor, cultural satire and the kind of murderous fantasies that run through all our heads when relatives overstay their welcomes. What this disappointing movie doesn’t have, however, is any clear idea of what it wants to be, do or say. Thanks to an odd combination of creepy images, sanitized scares and cartoonish violence, “Krampus” can’t even decide what audience it wants to please. “Krampus” begins with a typically jaundiced look at Christmas — stampeding shoppers, crying children — and then focuses on young Max (Emjay Anthony), who rather sweetly refuses to outgrow his belief in Santa Claus. His parents, Sarah and Tom (Toni Collette and Adam Scott), are wealthy and overstressed, though we don’t know why on either count. Things only get worse when low-class Aunt Linda (Allison Tolman) and Uncle Howard (David Koechner, providing a few bright spots), show up with their uncouth brood. Teased about his childish beliefs, Max rips up his letter to Santa and unwittingly releases the Krampus, a figure from Germanic folklore that functions as a kind of anti-Claus. Max’s German-speaking grandmother, Omi (Krista Stadler), warns that the Krampus comes not to give but to take. From here, the movie becomes increasingly confused. It traffics in familiar horror-movie tropes — evil clowns, snarling toys, cloven-hoofed creatures — but studiously avoids gore, splatter or genuine jolts. People are abducted, but we never see them die; at times we suspect they may still be alive somewhere. The rudimentary effects and costumes give the whole production a harmless, amateurish feel. Co-written by Todd Casey and Zach Shields, “Krampus” has one of the most wretched third acts you’ll ever see, a series of conflicting endings that make no cumulative sense. In one of these endings, various characters simply sit around wearing strange expressions. When the credits finally roll, you may do the same thing.